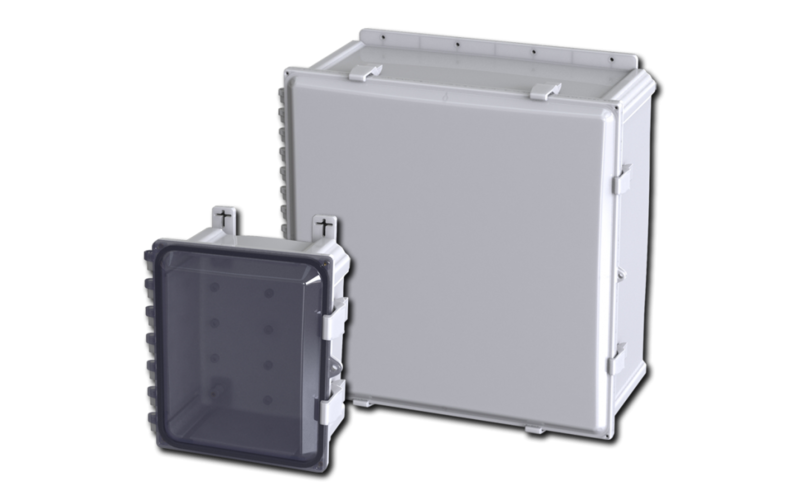 Saginaw Control & Engineering’s selection of Non-Metallic Enclosures now includes a line of Polycarbonate Enclosures. These are available with an opaque or clear cover and are designed for indoor or outdoor in areas that may be regularly hosed down or are in very wet conditions. The enclosures are made of non-corrosive, UV and impact resistant polycarbonate and come in 8 sizes: 6×6, 8×6, 10×8, 12×10, 14×12, 16×14, 18×16, and 24×24. Swing Out Panel Kit available, SCE-PCSP. Brass inserts for securing mounting feet. Polycarbonate external mounting feet included. Polycarbonate hasp and staple for padlocking. 10-32 standoffs provided for mounting optional panels. Multiple bosses for easy installation of devices and DIN rails. RAL 7035 Light Gray finish. UL Listed Type 3R, 4, 4X and 12. For more information take a look at the Polycarbonate Enclosure selection on our website, or contact your sales rep today!